Our first Aerangis species is one of our favourite orchids. 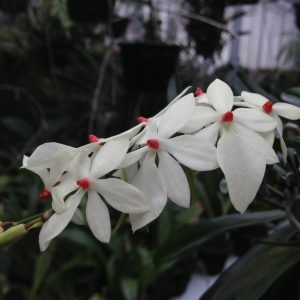 This small growing species is native to tropical Africa from Cameroon across to Kenya and Tanzania. It is pollinated by moths and so is fragrant at night as well creamy white to show up in the forest at night. The red column helps the moth to locate the entrance to the spur full of nectar (look just below the red column). 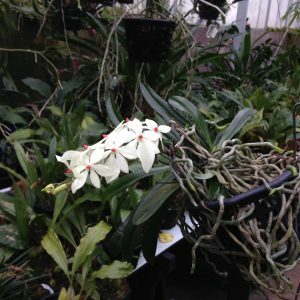 This is a lovely orchid to grow – it likes a warm and shady environment and we grow the species mounted and in small baskets (the plant is only 12cm across) in our Warm Asia section (although it is from Africa) with a minimum of 16C. It comes from riverine forest (the humid forest found along rivers) from 1200m altitude to 2200m altitude and so it would also grow happily a little cooler. Like Aerangis and related species we have seen in coastal forest near Durban (South Africa) this species is found on twigs and small branches with roots running long distances to collect available moisture. An exciting feature of the species is the speed with which it flowers from seed. It can flower just three years from flowering and so it will be one of the species we target for our new project in Kenya to set up orchid propagation projects in schools in Nbeere.